Retired 2015 Effanbee Tonner Doll Company Fashion including Original Shipper. An Original Mint In Box Effanbee Patsy OUTFIT. One of Effanbee's great success stories was the Patsy doll designed by Bernard Lipfert and advertised in 1928. Patsy was one of the first dolls to have a wardrobe. She portrayed a three year old girl with short bobbed hair with a pouty mouth, and wore classic dresses. In 2002, Robert Tonner of the Tonner Doll Company acquired Effanbee. 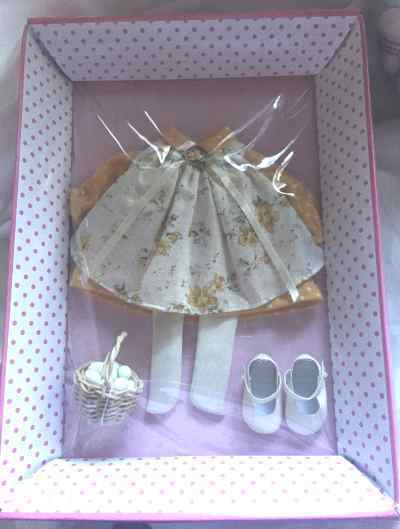 This is an Effanbee Patsy OUTFIT, to fit a 10 inch doll. Your Patsy doll will look adorable in her Patsy Rise and Shine Outfit. A mustard yellow polka dot underdress. Off-white floral dress with ribbon and faux flower decoration. Off-white faux leather shoes. Basket with faux eggs. This is an outfit only. Fits 10" bend knee child body.